As monarch butterflies make their 2,500-mile migration from Canada to Mexico this fall, they’ll pass through Western North Carolina at roughly the middle of their journey. Tragically, far fewer of the winged beauties are making the trip, as the population has shrunk nearly 90 percent in the last 20 years. As the butterflies have inched perilously close to extinction, self-professed “monarch-aholic” Nina Veteto launched Monarch Rescue, an Asheville-based nonprofit. Along with help from numerous volunteers, she strives to create habitats for monarchs by partnering with local communities and businesses. Last year, Monarch Rescue teamed up with the Housing Authority of Asheville and schools across the region to plant large patches of milkweed, the only plant on which the butterflies lay their eggs. Educational outreach is also an important facet of the effort, with Monarch Rescue offering programs to second-grade students in 11 schools in Buncombe, Madison, Yancey, and Mitchell counties. During in-depth classroom sessions, volunteers teach students about the butterfly’s migration patterns and conduct a number of hands-on activities. In the spring program, students are given “seed-bombs” containing milkweed to plant in their backyards. On September 17, Monarch Rescue is hosting Monarch Day at the North Carolina Arboretum. “The program is a family-oriented day where folks can come and learn about the monarchs,” says Veteto. 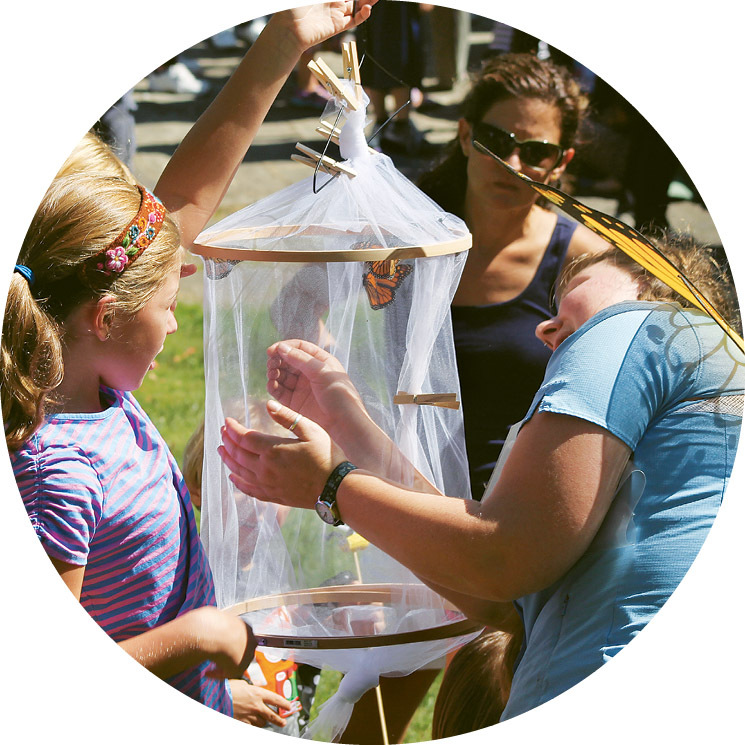 “Last year’s event was super successful, and we hope to hold one every year.” Visitors can participate in citizen science projects, watch tagging-and-release demonstrations, make butterfly-themed crafts, and purchase milkweed, with proceeds benefitting the Arboretum’s youth education initiatives. To encourage monarchs to visit your own backyard or garden, plant milkweed in a sunny area. Visit www.monarchrescue.org for growing tips and additional info. Located at milepost 415.7 on the Blue Ridge Parkway, just south of Mount Pisgah, this overlook is a popular spot for viewing monarchs. There’s even a plaque noting their yearly visit. While it’s one of the most iconic places in Western North Carolina year-round, this Rutherford County destination sports both monarchs and stunning fall leaves in September. At Table Rock, situated in the Linville Gorge in Burke County, monarch watching goes hand in hand with stellar hiking.